This game holds a very special place in my heart. As a kid, I can remember playing this on the PS1, not quite understanding it as well as I do now, and maybe not playing as well as I could now, but dammit, I had fun. 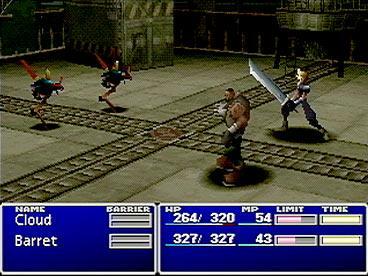 If you ever played this game, maybe your experiences differed slightly, but however you played the game, Final Fantasy VII is hailed as one of the greatest games in the universe ever. Maybe. It's definitely highly acclaimed, but whether the previous title is true or not remains to be confirmed officially by the boys down at the lab. The Final Fantasy games have always been pretty damn awesome, and are definitely a stand out series in the RPG genre of video games. The very first game was made as a last ditch effort of saving the studio from dying out, the 'final' fantasy game for them to make. Luckily for them it worked, and from there on we've had a nice load of newer games from the series. They aren't sequels as such, though the games all share similar ideas in their gameplay and story premise. In each game, you're gradually introduced to your characters, your world, its setting and basic story plot to begin with. But soon, things will take a turn for the worst, and the antagonists will be revealed. The stories in the Final Fantasy games are usually always an incredible journey throughout the respective worlds, and tell a beautiful, enchanting tale with plenty of twists and turns. Final Fantasy VII's story is one that has always been my favourite of them all. The premise to begin with quickly throws you in the boots of Cloud Strife, a spikey haired mercenary hired by the 'terrorist organisation' A.V.A.L.A.N.C.H.E., who are planning to blow up one of the mako reactors, the stations that give electricity and power to the city of Midgar and the rest of the planet, a technological/medieval setting that the game is based around. A kind of early steampunk style, but not quite full blown. Seconds in from riding in on the train to the reactor, you're quickly thrown into your first battle of the game, two soldiers of the S.H.I.N.R.A. army, and organisation that runs the production of the plants and is essentially the rather shady government of the world. As you make your way through the groups of enemies you encounter, which include the soldiers, guard robots and flying parrots on patrol, you'll break into the reactor and head deep inside to plant a bomb and make your escape, with the presence of a descending timer nudging you towards the door threatening that dreadful 'Game Over' screen with every ticking second. Soon after your escape from the exploding reactor, the leader of A.V.A.L.A.N.C.H.E., Barret, a hot headed, strong-willed fighter with a gun for one arm explains the situation they're in, and what they're trying to do. To sum it up, the Mako reactors are hurting the planet, and Barret fears that if they don't stop the energy being sucked from the Lifestream, the planet will die and everyone else on it will follow just as quickly. So that's your set up. If you haven't played this game before, I'm not going to throw out any spoilers here, because it's bloody fantastic, and it's a story you really have to experience. Gameplay and graphics for the time were pretty cool. Obviously, this being a PS1 game, there isn't exactly HD graphics. FF7 was the first leap into using 3D styles in a Final Fantasy game, all the predecessors being in 2D, and it's not too shabby. Though the areas are pre-rendered, with the 3D character models etc layered on top, the art style is captivating and great to look at, each location brilliantly detailed. The graphics are a lot better in the fights however, a lot more detail put into both your heroes and the enemies they come across. The huge monsters you encounter can be rather scary when you first see them towering over your characters! 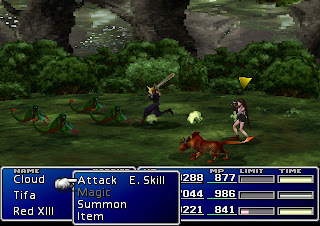 The fighting system is brilliant, and in my opinion the best style used in the Final Fantasy games with the inclusion of the Materia system, which allows you to completely customise your characters abilities, magic powers and give boosts to their HP or MP. Certainly an innovation in the genre in my opinion, and I'm rather disappointed that it hasn't shown up in any of the newer titles. Even when you begin to reach the ultimate climax to the story upon reaching the third disc, a whole new slew of things to do are unlocked and available to do. The Ruby and Emerald Weapons being a prime example of something that will haunt your dreams every night until you successful manage to smash the behemoths to pieces, a feat that isn't exactly easy. Something I almost forgot to mention, which is absolutely mad of me, is the sensational soundtrack created by the legendary Nobuo Uematsu. This is definitely one of the best bunch of songs for a game I've ever heard. I actually have the whole 4 CDs or so of songs on my computer to listen to whenever I want. And I find myself sticking them on pretty regularly to be honest. It's a true testament to composition when I can hear the same melodies or themes when I'm stuck in a dungeon and never get sick of it, and I've been playing this game for a Long, long time. Each score fits the scene perfectly, and Uematsu does an excellent job of stirring up the atmosphere at the most intense of moments. I could go on about this game for hours. The amount of hours I played it as a kid, when it was tragically taken away (or lost, I can't exactly remember...) I spent the years after always reminiscing about the story, the characters, everything I could remember. But as my memories faded of it, it became just that, a memory to me. Until I managed to pick up a copy of the game again around summer last year. Happy doesn't quite describe how I felt having a copy i my hands again. I'd started to worry on the way home that perhaps I'd just hyped it up in my head, having a happy childhood memory and building it up to be something it wasn't. And as well as that, technology has moved on a fair bit since the original Playstation. I had half expected to be a little disappointed with it, or for it to feel rather outdated in my hands and make me lose interest. I can very firmly say that neither of those things happened. When I finally got my rickety old PS2 out from its retirement, playing through the opening scenes of the game got me so excited as everything slowly flooded back to me. And picking up the story again, and essentially learning it from scratch again, understanding the plot and sub plots better than I had as a younger child was simply awesome. I'm personally a little disappointed with the latest titles from Square Enix, and kind of wonder where it wrong, for me anyway, but at least I can always have this golden treasure in gaming to keep me knowing that video games really can be an excellent source of entertainment. Or something. 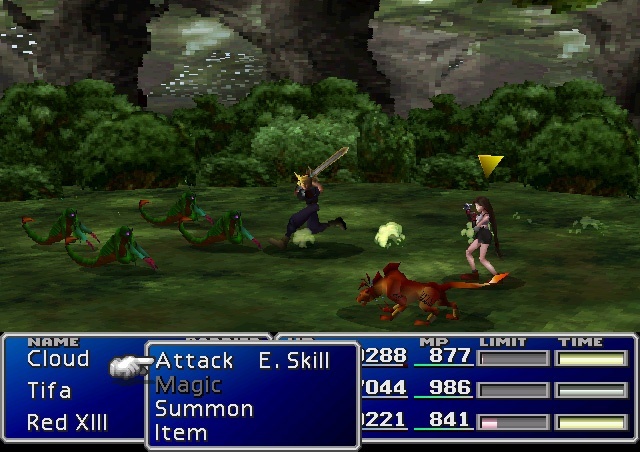 To round up, Final Fantasy VII is a game from my past that I freaking love. And I'm definitely not the only one. In my opinion, it's the best in the series, with the most satisfying story arc, most fascinating characters and a really immersive world. If you haven't played this game already, or at least heard of it, you're either too young to be on the Internet, or quite simply a fool. A fool I say! Go snap this up on eBay and play through a fantastic game that captured the hearts of millions.